Turn your abandoning web visitors into your most qualified leads. Apply to join our closed testing group for the newly redesigned ExitGadget. Test our software free for 60 days and experience how ExitGadget re-engages and retains your abandoning visitors. Your most qualified leads are already on your website. Convert up to 80% more of them! ExitGadget is an exit intent tool for your website that only deploys when a visitor is preparing to leave. This low cost sales generator works as your last minute, final line of defense against missed opportunities by offering a sale or incentive to the visitors you’re about to lose— increasing your conversions and sales! Put us to the test! 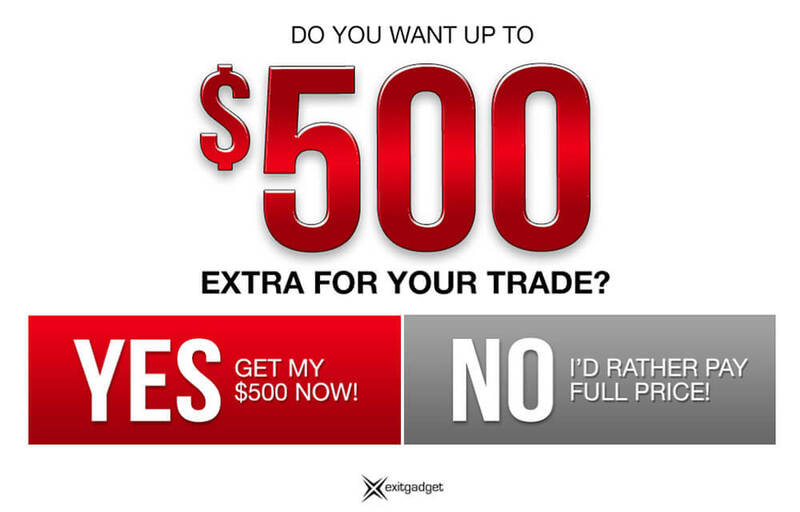 Use ExitGadget for 30 days, risk-free. Proven conversion-focused messages for any business and any industry. Design concierge to personally create a message for your audience. No contracts to tie you down if you’re not satisfied with your leads. Full support service to make sure you are fully satisfied and issue-free. Campaign analysis to tailor messages and increase your sign-ups and sales. When your web visitors leave, so do your chances of making sales. While we have a large assortment of ready to go ExitGadgets, our design team can build you a unique, custom message for your brand and offer. There are a lot of similar looking options out there. So why choose ExitGadget? Simple. We work! Our ExitGadget is a one tool wonder! We’re not loading a library of non-used tools that slow down your website! The best quality leads come from those already on your website, yet most web providers don’t have the proper conversion tools and opportunities capable of turning your traffic into leads. With ExitGadget— you will. The simple yet familiar design balances technical functionality with a message that provokes an emotional response. A potential paying customer walks in to your business and spends time looking around. Now, they are heading for the exit without making a purchase. You mention to them as they reach the door that there’s a sale, offer, or discount available. That’s ExitGadget! ExitGadget targets nearly 100% of customers leaving your website, once. Success and ROI is dependent on total traffic to your website, but we have many success stories that convert an additional 70+ leads per month. While results are dependent on a lot of factors, what we can guarantee is you’ll be impressed with all the extra website conversions you otherwise would have lost without our ExitGadget. This shows the AVERAGE leads per month received from our ExitGadget over a 6+ month time period. Typical or not, leads can and will happen! We’ve been building, installing, and supporting ExitGadget since 2014. In fact, in the last couple years we’ve generated over 48,000 leads for our clients! © 2019 ExitGadget. We convert before they leave.